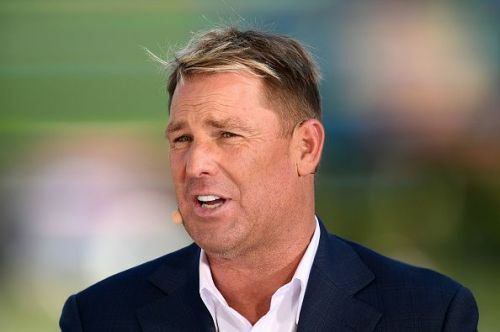 Spin legend Shane Warne on Friday criticised the Australian team picked for the three-match ODI series against India, terming the selections ridiculous and senseless for not keeping in mind the upcoming World Cup. "Just saw the Aust ODI squad that was announced & was absolutely staggered at some of the players that were left out & some of the inclusions - they don't make any sense whatsoever.These ridiculous selections must stop in all forms of Australian cricket - end of!" Warne tweeted. Shortly after Warne named his own ODI side on Twitter. The 49-year-old put his weight behind all-rounder D'Arcy Short. "I cannot believe that D'Arcy Short has been left out of the side. I don't know what he's done wrong. He can bowl and his batting at the top is dynamic. He's in terrific form, and he and Finch make an awesome partnership at the top," Warne was quoted as saying by foxsports.com.au. Warne insisted that the correct combination of players should have been selected keeping in mind the conditions the side will face in England during the World Cup in May-June this year. "When you're picking this team you want to look at some players you are interested in, but you've also got to look at those players with the World Cup in mind and the conditions you're going to have in England," he said. "Those conditions are going to be flat wickets that will probably spin a bit, so you need clever bowlers and you need some bowlers with pace. And they're little grounds. So a mixture of power hitting and people that can bat time; you need that right combination." Warne was also critical of pacer Peter Handscomb's treatment by Cricket Australia. "I don't think it's fair on Peter to keep putting him out into the international arena, even for the Sydney Test match here. Whether he makes 100 or 200, it's still not the right selection or the right message that you're sending to the rest of first-class cricketers." Handscomb was dropped for the Boxing Day Test after scoring 68 runs at 17 across his first four innings of the series before being brought back for the fourth and final Test. "To say you haven't got a technique that's good enough for international cricket and you're dropped, just like last year, and then you put him back in again a week later. It doesn't make any sense," Warne said. "I would have liked to see them go with a bit more youth and a bit more pace with the ball in Meredith and Pattinson to add to Jhye Richardson, I think those three are very good. Behrendorff with his left arm is okay, but I think there's better options." Completing Warne's 14-man squad are spinner Nathan Lyon and Chris Lynn. "Lynn is there if you need a bit more power at the top, then I've got Nathan Lyon that I'd like to see with the white ball as well at some stage." Warne, who has been critical of the Australian pace attack in the ongoing Test series, also denied holding any "personal vendetta" against the pacers. "The bowlers when you look back at 2018 and all the numbers they have put in for an attack that is meant to be one of the best in the world, the numbers don't stack up," he said. "That's facts, it is not a personal vendetta or anything like that. We have nothing against these guys, we are just dealing in facts."